This book, based on a large-scale research project funded by the National Institute of Justice and the Robert Wood Johnson Foundation, provides an overview of the restorative justice conferencing programs currently in operation in the United States, paying particular attention to the qualitative dimensions of this, based on interviews, focus groups and ethnographic observation. It provides an unrivalled view of restorative justice conferencing in practice, and what the people involved felt and thought about it. The book looks at four structural variations in the face-to-face form of restorative decision making: family group conferences, victim-offender mediation/dialogue, neighborhood accountability boards, peacemaking circles. 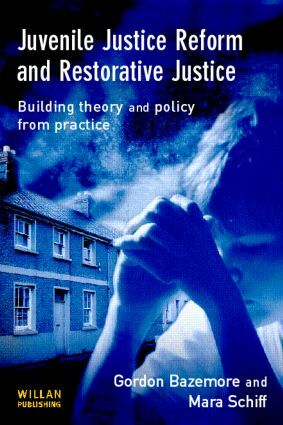 The authors address two issues that have received limited research emphasis in restorative justice: the lack of clear and consistent standards, and the absence of testable theories of intervention that reflect what has become a rather diverse practice. In response the authors conclude with a proposed structure for principle-based evaluation designed to test emerging theories of restorative decision making.